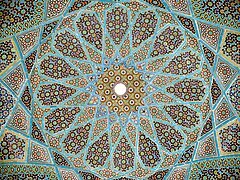 Encyclopædia Britannica։ Encyclopædia Britannica, Inc.
↑ George Saliba (1994), A History of Arabic Astronomy: Planetary Theories During the Golden Age of Islam, pp. 245, 250, 256–257. New York University Press, 0-8147-8023-7. ↑ Kenneth G. Wilson, The Columbia Guide to Standard American English (0231069898), p. 291: Muhammadan and Mohammedan are based on the name of the prophet Mohammed, and both are considered offensive. 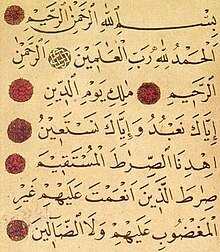 «Qur'an»։ Encyclopaedia of Islam Online : The word Quran was invented and first used in the Qurʼan itself. There are two different theories about this term and its formation. ↑ 85,0 85,1 Read, Study, Search Online. Sahih Bukhari. Retrieved on 2013-07-28. 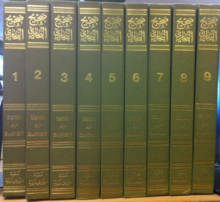 «Avicenna»։ Encyclopaedia of Islam Online : Ibn Sīnā, Abū ʿAlī al-Ḥusayn b. ʿAbd Allāh b. Sīnā is known in the West as "Avicenna". ↑ *Cohen-Mor (2001, էջ. 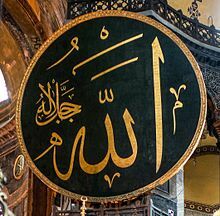 4): "The idea of predestination is reinforced by the frequent mention of events 'being written' or 'being in a book' before they happen: 'Say: "Nothing will happen to us except what Allah has decreed for us..." ' "* Ahmet T. Karamustafa։ «Fate»։ Encyclopaedia of the Qur'an Online : The verb qadara literally means "to measure, to determine". Here it is used to mean that "God measures and orders his creation". ↑ Qurʼan, Surat al-Tawbah 9:60 "Zakat expenditures are only for the poor and for the needy and for those employed to collect (Zakat) and for bringing hearts together and for freeing captives and for those in debt (or bonded labour) and for the cause of Allah and for the (stranded) traveller—an obligation (imposed) by Allah . And Allah is Knowing and Wise." ↑ Esposito John L., DeLong-Bas Natana J. (2001)։ Women in Muslim Family Law։ Syracuse University Press։ էջեր 2–։ ISBN 978-0-8156-2908-5 Quote: "[...], by the ninth century, the classical theory of law fixed the sources of Islamic law at four: the Quran, the Sunnah of the Prophet, qiyas (analogical reasoning), and ijma (consensus)." Ghamidi (2001): Customs and Behavioral Laws Archived 2013-09-23 at the Wayback Machine. Ghamidi (2001): The Dietary Laws Archived 2007-05-02 at the Wayback Machine. Ghamidi (2001): Various types of the prayer Archived 2013-09-23 at the Wayback Machine. ↑ Imam Kamil Mufti (2006). Modesty: An Overview. 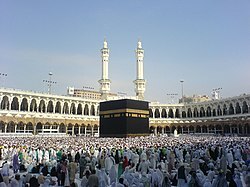 IslamReligion.com Retrieved 19 August 2016. ↑ Serjeant (1978), p. 4. ↑ Watt. 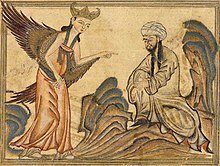 Muhammad at Medina. pp. 227–228 Watt argues that the initial agreement came about shortly after the hijra and that the document was amended at a later date—specifically after the battle of Badr (AH [anno hijra] 2, = AD 624). Serjeant argues that the constitution is in fact 8 different treaties which can be dated according to events as they transpired in Medina, with the first treaty written shortly after Muhammad's arrival. R.B. Serjeant. "The Sunnah Jâmi'ah, Pacts with the Yathrib Jews, and the Tahrîm of Yathrib: Analysis and Translation of the Documents Comprised in the so-called 'Constitution of Medina'." in The Life of Muhammad: The Formation of the Classical Islamic World: Volume iv. Ed. Uri Rubin. Brookfield: Ashgate, 1998, p. 151 and see same article in BSOAS 41 (1978): 18 ff. See also Caetani. Annali dell'Islam, Volume I. Milano: Hoepli, 1905, p. 393. Julius Wellhausen. Skizzen und Vorabeiten, IV, Berlin: Reimer, 1889, p 82f who argue that the document is a single treaty agreed upon shortly after the hijra. Wellhausen argues that it belongs to the first year of Muhammad's residence in Medina, before the battle of Badr in 2/624. 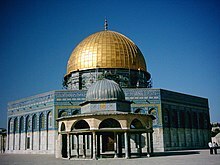 Even Moshe Gil a skeptic of Islamic history argues that it was written within five months of Muhammad's arrival in Medina. Moshe Gil. "The Constitution of Medina: A Reconsideration." Israel Oriental Studies 4 (1974): p. 45. ↑ R.B. 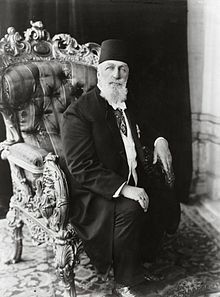 Serjeant, "Sunnah Jami'ah, pacts with the Yathrib Jews, and the Tahrim of Yathrib: analysis and translation of the documents comprised in the so-called 'Constitution of Medina'", Bulletin of the School of Oriental and African Studies (1978), 41: 1–42, Cambridge University Press. ↑ Watt. Muhammad at Medina and R.B. Serjeant "The Constitution of Medina." Islamic Quarterly 8 (1964) p. 4. ↑ Donald Puchala, Theory and History in International Relations, p. 137. Routledge, 2003. ↑ 228,0 228,1 Jacquart, Danielle (2008). "Islamic Pharmacology in the Middle Ages: Theories and Substances". European Review (Cambridge University Press) 16: 219–227. ↑ Toomer, Gerald (1990). "Al-Khwārizmī, Abu Jaʿfar Muḥammad ibn Mūsā". In Gillispie, Charles Coulston. Dictionary of Scientific Biography. 7. New York: Charles Scribner's Sons. 0-684-16962-2. ↑ 242,0 242,1 Ahmed, Imad-ad-Dean. Signs in the heavens. 2. Amana Publications, 2006. Print. 1-59008-040-8 pp. 23, 42, 84. ↑ G.J. Toomer. Review on JSTOR, Toomer's 1964 review of Matthias Schramm (1963) Ibn Al-Haythams Weg Zur Physik Toomer p. 464: "Schramm sums up [Ibn Al-Haytham's] achievement in the development of scientific method." ↑ Israeli, Raphael (2002). Islam in China. p. 292. Lexington Books. 0-7391-0375-X. ↑ 289,0 289,1 Robert Rabil Salafism in Lebanon: From Apoliticism to Transnational Jihadism Georgetown University Press 2014 9781626161184 chapter: "Doctrine"
↑ p. 18* Elsie, Robert. 2000. A Dictionary of Albanian Religion, Mythology, and Folk Culture. C. Hurst & Co. 978-1-85065-570-1. ↑ Usha Sanyal. Generational Changes in the Leadership of the Ahl-e Sunnat Movement in North India during the Twentieth Century. Modern Asiantudies (1998), Cambridge University Press. ↑ The Encyclopedia of Religion Vol.16, Mircea Eliade, Charles J. Adams, Macmillan, 1987, p. 243. ↑ 337,0 337,1 Ahmed Zarruq, Zaineb Istrabadi, Hamza Yusuf Hanson. 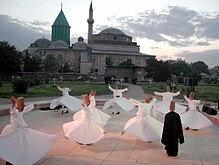 The Principles of Sufism. Amal Press. 2008. ↑ «Secrets of Islam»։ U.S. News & World Report։ Վերցված է 2013-09-24 Information provided by the International Population Center, Department of Geography, San Diego State University (2005). 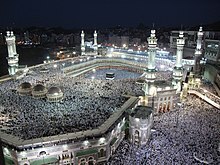 ↑ Secrets of Islam, U.S. News & World Report. Information provided by the International Population Center, Department of Geography, San Diego State University. ↑ The Mosque in America: A National Portrait Archived 2010-06-17 at the Wayback Machine. Council on American-Islamic Relations (CAIR). April 26, 2001. Retrieved on 2010-08-01. ↑ Ghamidi (2001): Customs and Behavioral Laws Archived 2013-09-23 at the Wayback Machine. ↑ Bible in Mohammedian Literature., by Kaufmann Kohler Duncan B. McDonald, Jewish Encyclopedia. Retrieved April 22, 2006.